Pesek-Hickson is a 247 Composite 3-star, the #44 athlete, and #743 overall. He explained that Michigan is tight on numbers right now and wants to get defensive end and defensive tackle grad transfers, meaning they no longer have room for him to sign his National Letter of Intent on Wednesday. Michigan is pursuing Rice defensive tackle Zach Abercrumbia and Central Michigan defensive end Mike Hanna. He did leave open the possibility of going to prep school, though he stressed that academics are not an issue. It’s not a great sign that his academics appear to be in order (he reported a 30 on the ACT) and Michigan wants him to go the prep school route, but Pesek-Hickson’s only other reported offer comes from Missouri State, so options might be somewhat limited. Michigan has had a couple players attempt to go the prep school route in recent years, with Brad Hawkins waiting from 2016 to 2017 to join the program, while linebacker Dytarious Johnson eventually ended up at Eastern Illinois. Michigan now has 26 commits in the 2019 class, and no more commitments are expected from high schoolers. While Pesek-Hickson was likely to play linebacker, he had the versatility to play a few different positions. Michigan still has several linebackers in the class, including Anthony Solomon, Charles Thomas, and Joey Velazquez, not to mention Daxton Hill and Quinten Johnson, who could both play Viper. The team currently has 86 scholarship players slated to be on the roster in 2019 (LINK), so some things will have to fall into place in order to fit all the 2019 signees and any potential transfers. 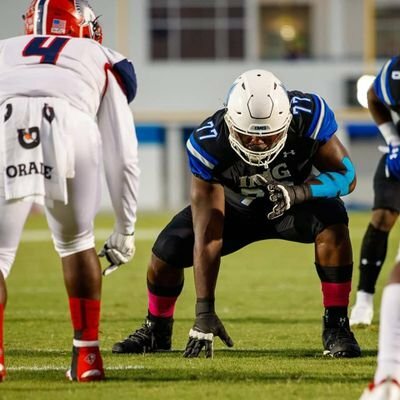 Chris Akporoghene – OT – Bradenton (FL) IMG Academy: Akporoghene is a 6’4″, 294 lb. prospect who has been committed to Tennessee since July of 2018; he also has offers from Florida, Miami, Michigan, Mississippi State, and Oregon, among others. He’s a 3-star, the #67 offensive tackle, and #819 overall. Akporoghene is a native Nigerian, moved to Tennessee, and then finished up his football career at IMG Academy. This is his official visit. Erick All – TE – Fairfield (OH) Fairfield: All is committed to Michigan (LINK). This is his official visit. Karsen Barnhart – OT – Paw Paw (MI) Paw Paw: Barnhart is committed to Michigan (LINK). He was recently upgraded to a 4-star ranking on Rivals. This is his official visit. Zach Carpenter – OG – Cincinnati (OH) Moeller: Carpenter is committed to Michigan (LINK). This is his official visit. Trente Jones – OT – Loganville (GA) Grayson: Jones is committed to Michigan (LINK). He’s currently a 4-star, the #18 offensive tackle, and #165 overall. This is his official visit. Amauri Pesek-Hickson – LB – Overland Park (KS) Blue Valley North: Pesek-Hickson is committed to Michigan (LINK). This is his official visit. Nolan Rumler – OG – Akron (OH) Hoban: Rumler is committed to Michigan (LINK). This is his official visit. Joey Velazquez – LB – Columbus (OH) St. Frances DeSales: Velazquez is committed to Michigan (LINK). This is his official visit. 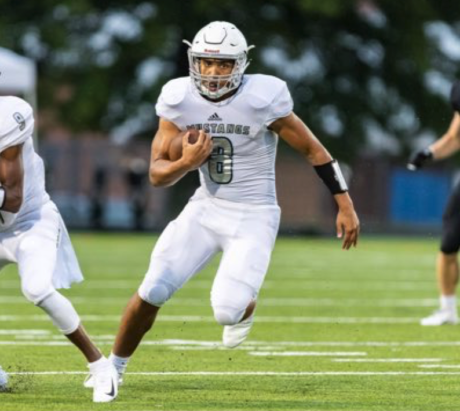 Leawood (KS) Blue Valley North athlete Amauri Pesek-Hickson committed to Michigan over the weekend. He picked the Wolverines over . . . uhh . . . Missouri State. Pesek-Hickson is listed at 6’3″, 210 lbs. As a senior in 2018, he ran 76 times for 563 yards, caught 38 passes for 595 yards, and scored 14 total touchdowns. Hit the jump for more on Pesek-Hickson’s commitment. 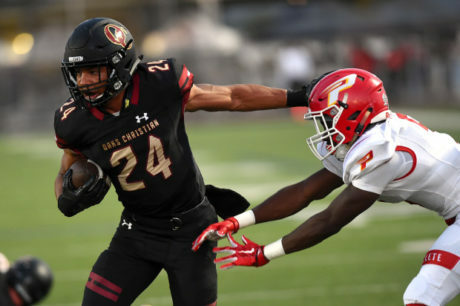 Zach Charbonnet – RB – Thousand Oaks (CA) Oaks Christian: Charbonnet is committed to Michigan (LINK). He’s now a 4-star, the #6 running back, and #100 overall in the 247 Composite. Eric Gray – RB – Memphis (TN) Lausanne: Gray is committed to Michigan (LINK). He’s a 4-star, the #3 all-purpose back, and #203 overall. UPDATE: Gray is no longer planning to visit. Mike Harding – TE – Redford (MI) Catholic Central: Harding is a 6’6″, 225 lb. prospect with offers from Bowling Green, Toledo, and Washington. He’s a 3-star, the #84 tight end, and #2005 overall. Brock Horne – LB – Romeo (MI) Romeo: Horne was recently offered a preferred walk-on spot by Michigan (LINK). George Johnson III – WR – Stuart (FL) Martin County: Johnson is committed to Michigan (LINK). Dawand Jones – OT – Indianapolis (IN) Ben Davis: Jones is a 6’8″, 360 lb. prospect with offers from Florida State, Indiana, and USC, among others. He’s a 247 Sports 3-star, the #82 offensive tackle, and #928 overall. He does not have a Michigan offer yet. Percy King – S – Gahanna (OH) Lincoln: King is a 6’0″, 178 lb. prospect with no offers at this time. Cole Kosco – QB – Poland (OH) Poland: Kosco is a 6’3″, 210 lb. prospect with no FBS offers at this time. David Ojabo – DT – Blairstown (NJ) Blair Academy: Ojabo is committed to Michigan (LINK). This is his official visit. Jalen Perry – CB – Dacula (GA) Dacula: Perry is a 6’1″, 188 lb. prospect with offers from Alabama, Auburn, Michigan, and South Carolina, among others, and he was previously committed to Georgia. He’s a 4-star, the #19 cornerback, and #172 overall. He visited Michigan a few weeks ago, but his crystal ball is 100% in favor of South Carolina. This is an official visit. Hit the jump for more visitors.